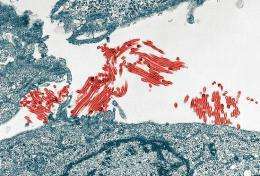 (PhysOrg.com) -- A new, highly detailed study of the H1N1 flu virus shows that the pathogen is more virulent than previously thought. Writing in a fast-tracked report published today (July 13, 2009) in the journal Nature, an international team of researchers led by UW-Madison virologist Yoshihiro Kawaoka provides a detailed portrait of the pandemic virus and its pathogenic qualities. In contrast with run-of-the-mill seasonal flu viruses, the H1N1virus exhibits an ability to infect cells deep in the lungs, where it can cause pneumonia and, in severe cases, death. Seasonal viruses typically infect only cells in the upper respiratory system. "There is a misunderstanding about this virus," says Kawaoka, a professor of pathobiological sciences at the UW-Madison School of Veterinary Medicine and a leading authority on influenza. "People think this pathogen may be similar to seasonal influenza. This study shows that is not the case. There is clear evidence the virus is different than seasonal influenza." And it is possible, he adds, that the virus could become even more pathogenic as the current pandemic runs its course and the virus evolves to acquire new features. It is now flu season in the world's southern hemisphere, and the virus is expected to return in force to the northern hemisphere during the fall and winter flu season. "When we conducted the experiments in ferrets and monkeys, the seasonal virus did not replicate in the lungs," Kawaoka explains. "The H1N1 virus replicates significantly better in the lungs." There are currently three approved antiviral compounds, according to Kawaoka, whose team tested the efficacy of two of those compounds and the two experimental antiviral drugs in mice. "The existing and experimental drugs work well in animal models, suggesting they will work in humans," Kawaoka says. so... if there are people with antibodies already, can't they be recruited to develop an effective vaccine using their antibodies without so much development time? Lane: that was my first thought as well. I thought that vaccines were based on the virus itself (in some attenuated form). Not on the antibodies.